SEO Tools are significant for increasing traffic on your website. Getting rankings and organic traffic on your website would be impossible if you don’t use proper SEO tools and techniques. There are uncountable free and paid SEO tools available online which can be highly beneficial for your website rankings. We have compiled a list of exceptional SEO tools. As you need more then one SEO tool to satisfy your need for increasing your website traffic. 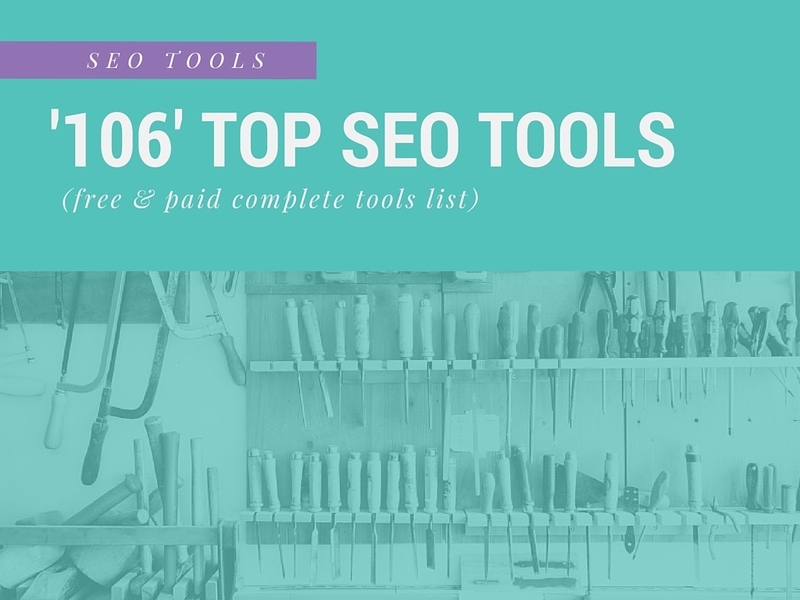 Let’s have a looser look at all the comprehensive list of top SEO tools . Anchor Text over Optimization Tool is used to identify anchor text diversity and also highlight those areas which are at risk for anchor text over optimization. This tool helps you in profitable list of keyword research. Small spider tool for websites’ links, images, CSS, script and apps from an SEO perspective. A Single hub to collect, translate & route your customer data. SpyFu Help you to download your competitors’ profitable keywords. It’s a tool Suite for Analytics and Link Research for traffic gaining. Help you to unlock the incredible capabilities of tool provider data from Majestic SEO, Moz and Grepwords within Excel. This tool helps in link Research, Competitive Intelligence and Link Building. Helps in API (Application program interface) that how software components should interact and Link Research. This SEO tool validate your XML sitemap. It makes your sitemap free from errors and ping to all major search engines. This tool put powerful web crawler and index of over 162 Billion URLs in the palm of your hands. This is an optimization tool to optimize title tags and Meta description tag. This tool help you to Link Research, defining, gathering, analyzing data and Link Building. Bing data webmaster tool uncover keyword data & drive traffic to your site. This tool help to find link opportunities, conduct link research or automate link building tasks. It helps you to analyze the performance and speed of your website. A Google chrome app used to easily inspect metadata on any site with one simple click. Help you to Track your site’s search performance. This site combine sets of words easily & automatically. This google plugin helps you to detects the theme and plugins used in WordPress and display information about them. it’s a plain text browser, which show you how crawler or search engine sees the page. This extension provides you SEO metrics for a specific page, along with other useful tools such as SEO Audit and many others. Helps you to get website stats directly from your browser. NerdyData is like a Search engine for source code. This site provide few tools to find broken links, redirects, site crawl tool, On-Page Optimization Tool and image and link analyzer tool. SEO Toolbar pulls in many useful marketing data points to make it easy and get a holistic view of competitive landscape of market directly in search results. This site provides you some Analytics, Social, On page, off page SEo tools. This site provides some Content Strategy Generator, Highcharts Generator and Infographic embedded tools. SEOquake tool is used to obtain information about any website for a wide range of parameters such as page rank, Google index, Alexa and many others. This site provide you some content checking and optimizing tool. Wordstream is a SEO keyword tool. It helps in performing ongoing organize, analyze keyword research. This SEO tool also provide the facility to search engine optimizer in keyword discovery tools, keyword grouping, long-tail keyword tools and SEO content creation tools. This toolbar gives a lot of information about SEO metrics, custom searches, Keyword ranks and also social media metrics. Tool for Research backlinks, identify top pages & analyze anchor text. Tools Suite, Keyword Research, Competitive Intelligence Research organic and paid keywords for any site or domain. This site provides lot of marketing related tools. This site provide Diagnostic, Content and Social marketing related tools. This site provides Social marketing and analytics tools. This site provides analytics and Social marketing tools. Google’s web analytics & reporting platform for your website to analyze your site and make site ranking more better. Google tool for API and Analytics. A leading open source Analytics platform. Track your URL shares, likes, and more. This tool help you to find duplicate content, broken links, & benchmark data. Generate new keyword suggestions around your main keyword. This tool helps a lot to find keywords that people are mostly used while searching on YouTube.com. This tool give you the right keywords that you can use in YouTube keyword description and title, So YouTube and Google give you the right audience for your video. This tool help you to analyze your videos for better optimization. A social analytics solution tool. Tool to use statcounter to monitor actual human activity in real-time. It is a Google algorithm update & penalty checker tool. This Mozilla Firefox extension creates a plain web page similar to how the page would be read by a modern screen reader. This is a google tool to generate your sitemap for search engine. A tool which is used from word to clean HTML conversion. This tool strips out invalid or Impropriate tags. This help you to create your sitemap. So you can submit it to Search engines (Google, Yahoo, Bing, etc). It helps you to test your website speed and performance. This tool is used for removing duplicate pages. Limited data mining extension for facilitating online research. Gives you the facility to Find, Analyze, and Optimize your Social Growth. Smarter way to share things on social media. Help you to Track your URL shares, likes, and more. This social tool helps you to find, optimize, and engage your Twitter audience. Used for real-time social media search and analysis. Tool for your social media search and analysis. Help you to find out what websites are built with. This tool help you to check your site history. A platform for Search & Content Performance. This site provide you the flux charts. Discover your own site or app and competitor’s’ website traffic statistics. This site provide you the complete information about your domain name, IP address and honor name etc. This site helps you to supercharge your website. This site help you to find inspiration for your research topics quickly and easily. This tool is used for plagiarism checking. This software help you to detect the duplicate content and check if your articles are original or not. It provide your site metrics. This online tool help you in link building and Content research. Help you to find similar pages on your site. This is a quick, easy, web based way to clean up text and fix them when copying and pasting between applications. It remove email indents, find and replace, clean up spacing, line breaks, word characters and more. It gives you greater prominence to words that appear more frequently in source text. It helps you to improve your existing content. A/B Testing Software for Marketers. An optimization platform for websites and also provide A/B testing service. It helps you to discover your new link immediately. A Site for to quickly find out what’s wrong with your website or code. Provides you Free tools to grow your website traffic. The only WordPress SEO plugin you’ll likely ever need to optimize your wordpress site. And also provide lot of features to support you site. This toolkit helps you with his detailed analysis and search engine friendly suggestions which helps to improve the relevance of your website in search results. Predict how your web page will look in Google’s search results. Help you to optimize your SERP snippets for higher click-through rates. Tool which gives you the facility for testing structures data markup and also rich snippet display, including schema.org marked up in microdata, JSON-LD, RDFa, RDFa lite, and Microformats. This tool can optimize the content of your titles and snippets to maximize the CTR (click-through rate) from Search engine (Google). This tool Analyze your robots.txt file to help ensure Google and other search engines are crawling properly or not. Search engines create a structure data standard which is called schema.org. This tool help you to quickly build and get started with schema.org microdata. Google tag manager is easy for marketers to add & update their website tags. URI Valet is a culmination of tools which you can use on regular basis when performing technical audits, site reviews and overall document quality control. This tool automatically connects to your site and starts crawling in your site as any search engine (Google, Bing, Yahoo, etc.) would crawl it up. Quickly analyse, audit and review your site’s code & onsite SEO. This tool help to ensure that search engines (Google, Yahoo, Bing, Etc.) are crawling and indexing your site properly or not. It’s a free rank checker tool for firefox. This help you where to list your business, examine your competition, and monitor your citation growth for better local search rankings. Google Keyword plan your search campaigns & discover keyword traffic data. This tool help a lot in keyword research. It is very useful for keyword analysis for both our PPC (Pay per Click) and SEO Campaigns. This feature help you in keyword research and exploring the top searched topics. This tool helps a lot to quickly find new keywords which are not available in the Google keyword planner. It is a free keyword research tool. It helps you to make your web pages fast on all devices. This tool is used to analyze the load speed of websites then find bottlenecks and tells us how to resolve them. What are the certifications in agile? How Agile Practices Improve Release Management? How having a Lean-Agile Mindset benefits agile teams?